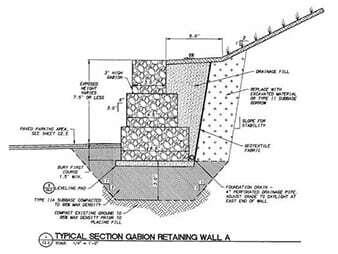 NOTE: THE FOLLOWING INFORMATION IS PROVIDED AS A GUIDE TO ASSIST CONTRACTORS AND DO-IT-YOUR-SELFERS IN THE PROPER CONSTRUCTION OF GABION RETAINING WALLS. 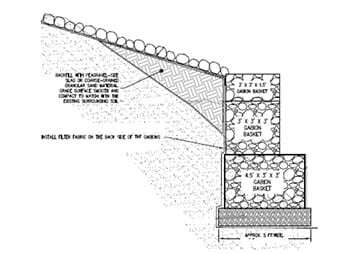 THE PHOTOS AND ILLUSTRATIONS SHOWN ON THIS WEBSITE ARE EXAMPLES OF TYPICAL MULTI-COURSE GRAVITY RETAINING WALLS. THIS CONTENT IS PRESENTED FOR GENERAL INFORMATION PURPOSES ONLY AND SHOULD NOT BE TAKEN AS A SUGGESTED DESIGN OR PROFESSIONAL ADVICE FOR BUILDING YOUR WALL. 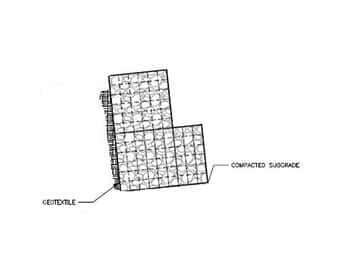 WE ALWAYS RECOMMEND THAT YOU CONTACT A LOCAL PROFESSIONAL ENGINEER TO EVALUATE SOIL FOR GABION WALL DESIGN AND BASED ON A CERTIFIED GEO-TECHNICAL SOIL REPORT OF THE SITE LOCATION. The base width of a gabion gravity retaining wall is directly related to the height of the wall. As the wall height increases, the base of the wall must become wider to ensure structural stability. 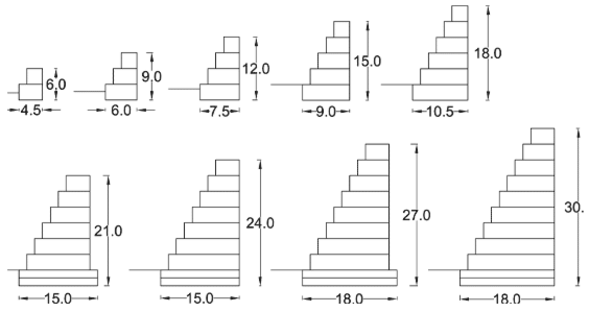 We have provided the diagrams below to illustrate a starting point for design analysis to determine the base width relative to the wall height. A conservative rule-of thumb value of base width = 2/3 wall height. 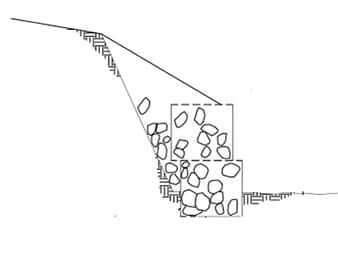 Note: A professional stability analysis may determine that the gabion gravity retaining wall base width could be less or greater than the 2/3 wall height rule. DURA-WELD and DURA-FLEX gravity retaining walls can be designed and constructed up to approximately 30’, however due to the configuration of gabion gravity retaining walls their best suited for wall heights of 18’ or less. For wall heights of 18’- 36’ see the Stable Slope Section of this web site. Gabion wall base width relative to wall height base width of a gabion gravity retaining wall is related to the height of wall so as the wall height increases the base becomes wider to ensure structural stability. Below is a suggested diagram to illustrate a starting point for design. A typical conservative value of base width = 2/3 wall height. 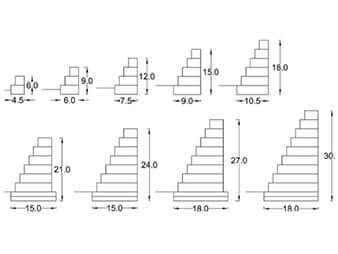 *** A stability analysis may determine that the gabion gravity retaining wall base width be less than or greater than 1/2 - 2/3 wall height. 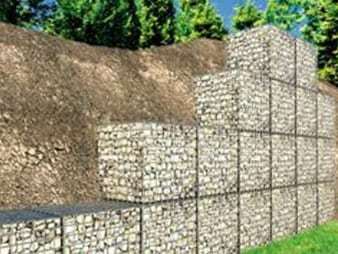 Gabion gravity retaining walls are typically placed directly on a graded soil foundation. To increase the bearing capacity, minimize differential settlement, and/or allow for additional drainage, a base layer of granular stone fill with consistent gradation ranging from ½” to1-1/2" may be placed and compacted to local standards 6” – 18” in depth. 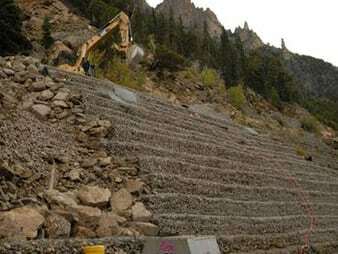 It may be determined, through a stability analysis, that additional stability of the gabion gravity retaining wall may be required to achieve acceptable factors of safety from sliding. 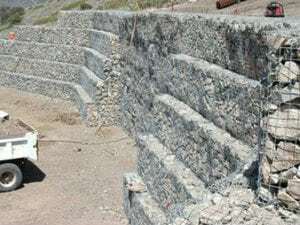 Options prior to enlarging the gabion wall cross section for additional stability is to excavate and bury half of the first course baskets and erect the gabion gravity retaining wall on a 5 - 6 degree batter towards the retained slope. This will require the foundation soils to be graded and compacted to accommodate for the specified wall batter. 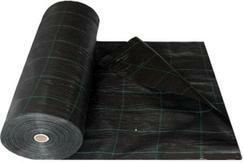 GEO-TEX geo-textile filter fabric is a vital component of any gabion retaining wall project. 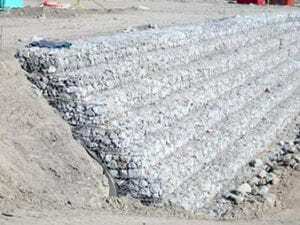 The rock voids within the gabion baskets allows for free drainage of the retained soils and requires a filter fabric be placed between the gabion wall and the backfill soil interface. The geotextile filter fabric will minimize hydrostatic pressure and prevent loss of soil during drainage and drawdown. Gabion gravity retaining walls constructed without the placement of filter fabric will have a tendency to incur a loss of retained soils and grade elevation behind the gabion wall. 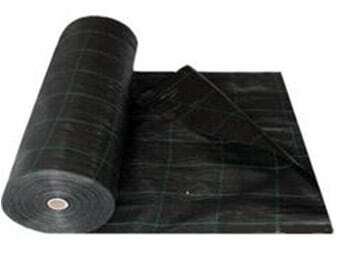 The type of backfill soil specified will determine the type, and placement of the geotextile filter fabric. To provide the maximum resistance to soil forces the gabion baskets should be placed with the length dimension of the gabion unit running from the back of the gabion wall to the front face of the gabion wall. This will result in the internal diaphragms being placed perpendicular to the wall face and parallel to soil thrust. 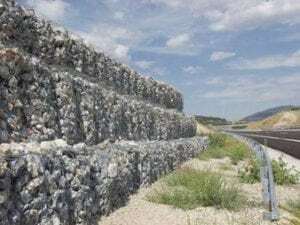 When gabion units are placed with the length dimension of the gabion unit running parallel with the length dimension of the wall the vertical seams shall be offset. For gabion gravity retaining walls that are 15’ – 30’ in height the gabion basket foundation and bottom courses shall be placed in 1.5’ vertical lifts to better absorb the compression and shear stresses. 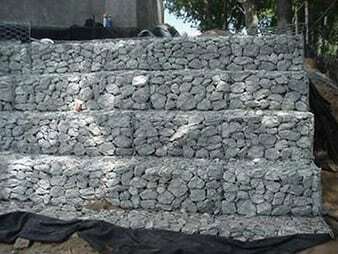 Gabion retaining walls can be designed and configured with a stepped front face or a smooth front face. 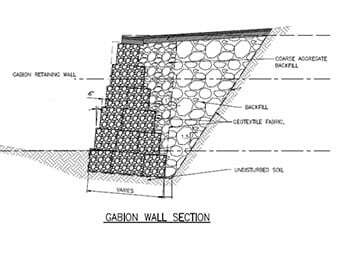 When utilizing a gabion wall with a smooth front face, the gabion wall should be placed on a 5-6 degree batter and is not recommended for walls above 18’ high. 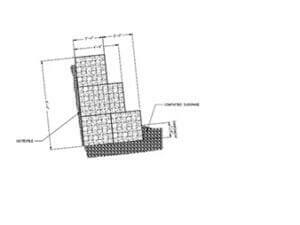 Gabion walls with a stepped front face shall have a minimum 1’-1.5’ horizontal setback for each 3’ vertical lift. Gabion gravity retaining walls can be designed and constructed up to approximately 30’, however due to the configuration of gabion gravity retaining walls their best suited for wall heights of 18’ or less. For wall heights of 18’- 36’ consider two separate walls divided by a level plateau or see the Stable Slope Section of this web site. 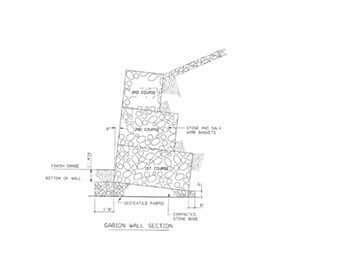 The base width of a gabion gravity retaining wall is related to height of wall. As the wall height increases the base of the wall becomes wider to ensure structural stability. We have provided the diagrams above to illustrate a starting point for design analysis to determine the base width relative to wall height. A conservative value of base width = 2/3 wall height. 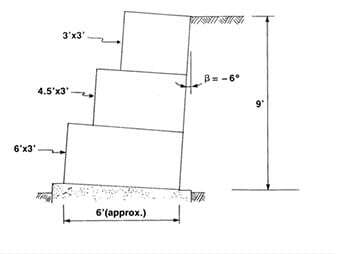 A professional stability analysis may determine that the gabion gravity retaining wall base width be less than or greater than ½ - 2/3 wall height. NOTE: All the above examples are for information only and not to be considered design recommendations. The information provided in the above examples including geo-technical data, dimensions and site conditions are assumptions made by manufacturer and should be reviewed and certified by a Professional Engineer. Please check Local, State and Federal requirements.